Hello! I'm so happy to be dipping my toes back into blogging waters. I've found myself on an accidental blog hiatus. This past weekend, however, I went through pictures and am now ready to share a bit of what has been occupying my time. In the interest of not writing the longest post ever, I've divided the three months into three posts. Logical, right? :) Here's a look at my February. . . The above picture shows a couple of my history textbooks along with the focus of my extra time: ACT prep. I took that rather momentous test toward the beginning of the month, right after attending. . .
Storling Dance Theater's production of Underground. I had also enjoyed seeing it a couple of years ago, yet found plenty to appreciate a second time. Besides, not only were the story and choreography there to be admired, but also the added pleasure of seeing a dear graduate from my homeschool ballet group dance one of the lead roles. Such fun going as a group to see her perform! Back at our dance studio normal dance classes still took place, with choreography for our production of Helen Keller picking up speed. I even found a quiet moment in an empty room to take this slightly impressionistic picture. Trying to achieve balance. . .
Friends, in fact, for whom I get to babysit. 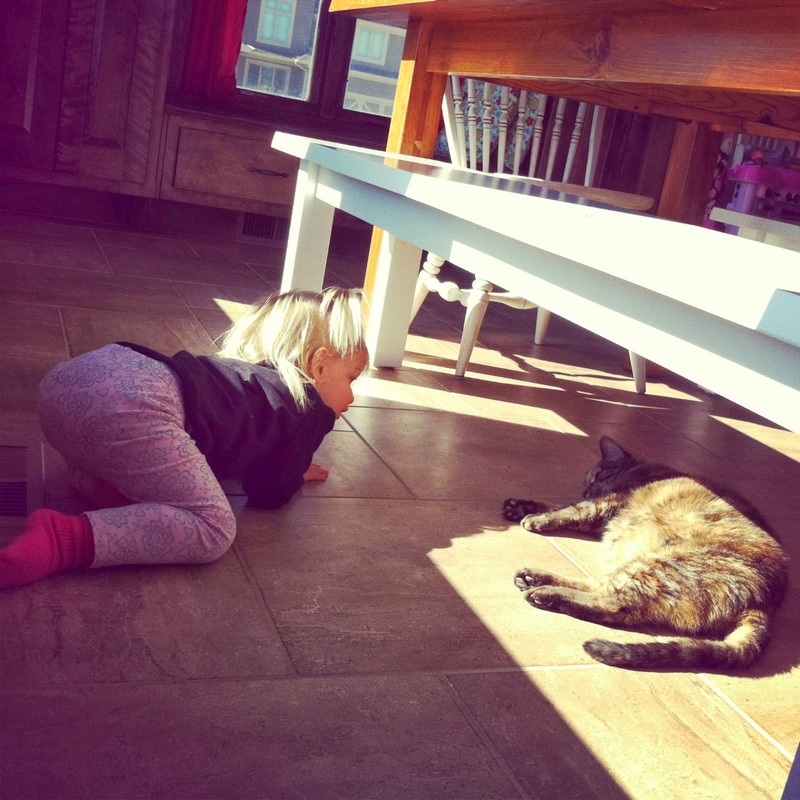 I also happen to love this little girl and her attempts to play with the kitty. Another fun babysitting opportunity popped up for Middle Sister and me in the form of providing childcare at a local church. We attended a blur of color and activity in the nursery while parents attended a brief seminar in the sanctuary. I did some Bible studying myself at my church youth group's Disciple Now weekend. It was a time of great teaching and community, including Micah 6:8, mint tea, and hiding in a closet we nicknamed "Narnia" during Underground Church. The next weekend included a different delightful event, a dear friend's 16th birthday party. Hooray for my first time playing laser tag and for an incredibly fun array of socks! With it still being winter, we definitely needed to be wearing socks. The temperatures stayed low and the ground maintained a blanket of white. With us still having puppies, instrument practices often gained audiences. And homework times included cuddly (sometimes calm, frequently rather crazy:) company too. Hi, there! So happy to see this glimpse of your February. The photo of the little girl and her cat strikes me as painterly. It would be beautiful as a watercolor. . . perhaps it's something about the light. Happy dancing, sweet girl! Hug your mom for me, ok?